This jetter propels a highly flexible hose through 1 1⁄4" to 6" (32 mm to 150 mm) lines blasting through sludge, soap and grease blockages. As you pull the hose back, it power scrubs the line flushing debris away, restoring drain lines to their full, free-flowing capacity. Powerful - Actual working pressure of 2200 psi (150 bar) and flow of 2.4 GPM (9 l/min) for fast, effective cleaning of lines. Easy to Use - Thrust propels the hose down the line. You simply guide the hose into the drain. Pulse Action - Activate the KJ-2200’s pulse action to easily negotiate difficult bends and traps. 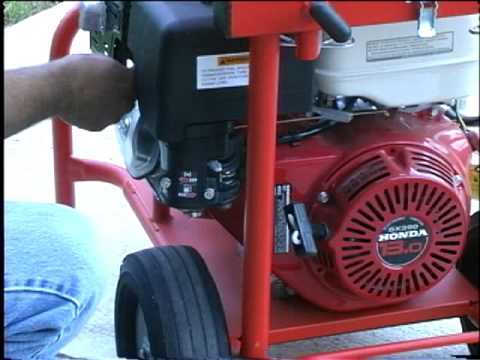 Portable - The optional H-30 cart rolls the jetter and hose to the job site. The jetter is easily removed from the cart in seconds for hard to reach drains, indoor applications or remote storage. Convenient - Standard equipment includes FV-1 foot valve. It makes remote or indoor operation simple and safe. You control the jetting action at the drain while leaving the jetter outdoors. Quality & Dependability - Triplex pump with corrosion-resistant, forged brass head. Reduced number of fittings, hoses and parts minimizes leaks and down time – keeping you on the job. Versatile - Optional power washer package cleans cables, tools and other heavily soiled equipment. New and improved 6.5 HP Recoil start gasoline engine starts easily. Features: ON/OFF switch; choke and throttle controls; easy access oil fill and dip stick. KJ-2200 Water Jetter is rated 4.7 out of 5 by 3. Rated 4 out of 5 by Snowfred15 from Very nice for 1 1/2 and 2 inches pipes Easy to clean small pipes. For larger size it do a good job with assistance of a camera. Easy to install and to use! Rated 5 out of 5 by Dawnpurple2014 from It can get through mostly everything. For any bad clogs this would be the best thing to get! !